"We are developing a suite of capabilities which we hope will lead to MAVs that exceed the capabilities of existing small aircraft. The level of autonomy and mobility we seek has not been achieved before using robotic devices on the scale of insects," said Wood. Wood and his research team are trying to understand how wing design can impact performance for an insect-size, flapping-wing vehicle. Their insights will also influence how such agile devices are built, powered and controlled. "A big emphasis of our AFOSR program is the experimental side of the work," said Wood. 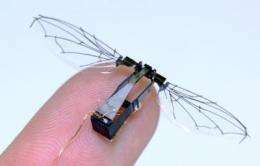 "We have unique capabilities to create, flap and visualize wings at the scales and frequencies of actual insects." One day i can imagine some terrorists holding a secret meeting and wondering if that fly they see is actually a camoflged us spybot. Saying that with big brother i can imagine sitting in my garden and wondering the same with the dragonflys i often see in my garden!!! Note how often you see new robotic breakthroughs labeled "To help the environment, or to help in search and rescue." Interpreted correctly they mean: "Search and destroy". Some where down the line the military is funding these projects. Pure awesomeness. I love this type of stuff. Of course I am betting that these things could be defeated through the use of magnetic fields.. or a mosquito net.